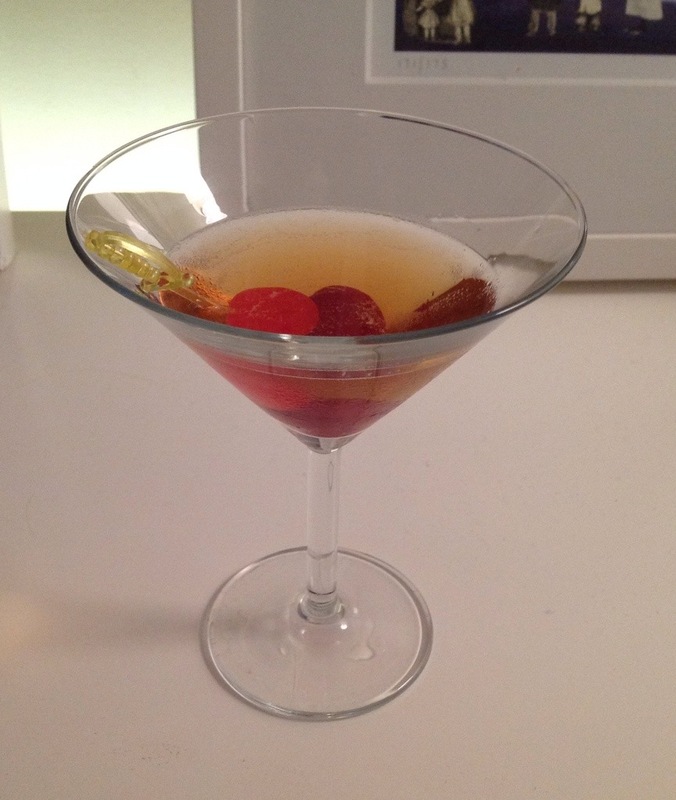 Tonight, a variation to a favourite recipe: the Brooklyn is based on the traditional Manhattan sweet, but instead of the bitters, a few dashes of maraschino are added to give a more fruity flavour. The combination makes the drink sweeter and somehow less intense, but it is distinctive enough to warrant a whole new name, I think. I have found descriptions of the recipe which include Galliano, but I cannot imagine how that would turn out. 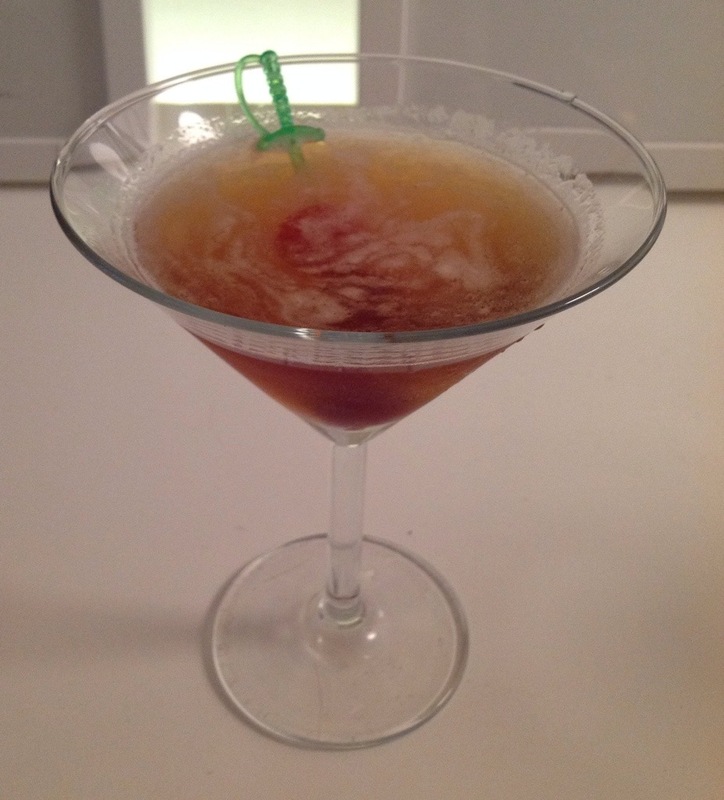 This recipe is one of the ‘Five Boroughs collection’, cocktail recipes that represent distinct areas of New York: Manhattan, Brooklyn, Queens, The Bronx & the Staten Island Ferry. My version comes from Schumann’s American Bar, simply one of the best cocktail books published. The recipe calls for neither bitters, nor a garnish (two things I look for in a true cocktail), but adding a slice of orange hardly seems like a major crime. There seems to be some disagreement as to whether the cocktail should be mixed with sweet vermouth or a dry aperitif (see the notes about Amer Picon, below); I am using a sweet vermouth here – we can try the dry version another time. Method: Put all ingredients into a shaker with ice & stir until well chilled. Strain into Martini glass & garnish with a slice of orange peel (or a cocktail cherry, if preferred. I think the citrus hit of the orange is preferred however). History notes: The cocktail seems to originate at the turn of the C20th, in a book called Jack’s Manual (J.A. Grohusko, 1908). Back then, the recipe called for a rare aperitif called Amer Picon, which seems unavailable to drinkers in N America, though still available to us in Europe – Gerry’s stocks it, naturally. I have to admit to no great fondness for flavoured vodkas, except for a good lemon flavoured version in a Cosmopolitan, but I was intrigued by the idea of Black Cow vodka. This is made from the whey produced in cheesemaking, and produces a very interesting creamy-flavoured vodka, which is perhaps not that surprising. I tried using it to make a simple vodka martini, adapting the recipe if found on the Black Cow blog from Joshua Linfitt, mixologist for the Fifteen restaurant in Cornwall. 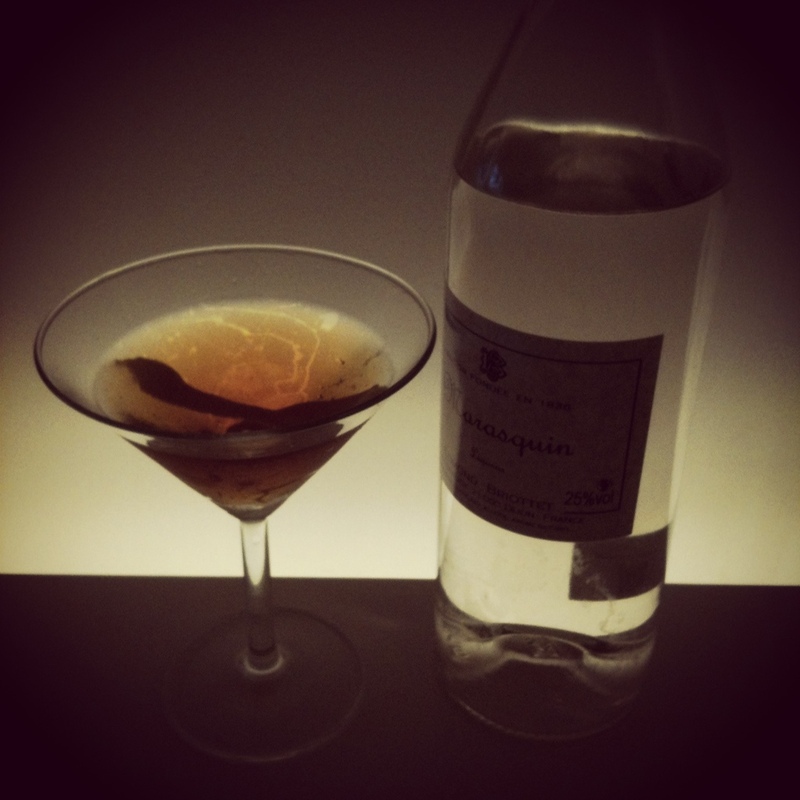 In Joshua’s recipe, he uses a vanilla-infused vermouth (which I also intend making, as I like the sound of it). Not having vanilla vermouth to hand, I made it the next best way: Noilly Prat vermouth, and a few drops of Bob’s Bitters re-boot of Abbott’s, with its powerful vanilla hit. 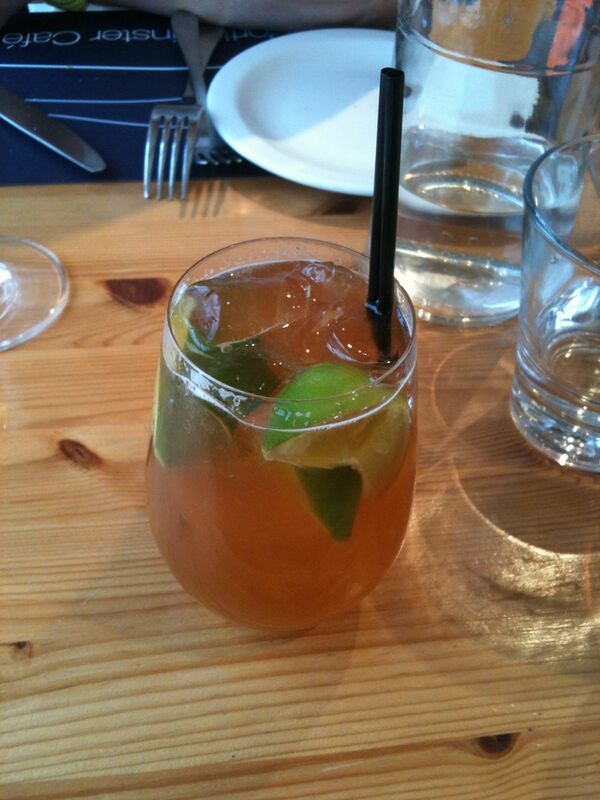 I garnished the drink with a large slice of orange peel in a nod to the original recipe. The results were absolutely gorgeous – the creamy vodka, vanilla bitters and citrus zest combine in perfect measures. This is an absolutely cracking drink, and one that deserves thinking about a proper name. Stir vermouth together with ice in a Boston shaker jar and tip away around half the vermouth. Add the vodka, drops of bitters & stir again. 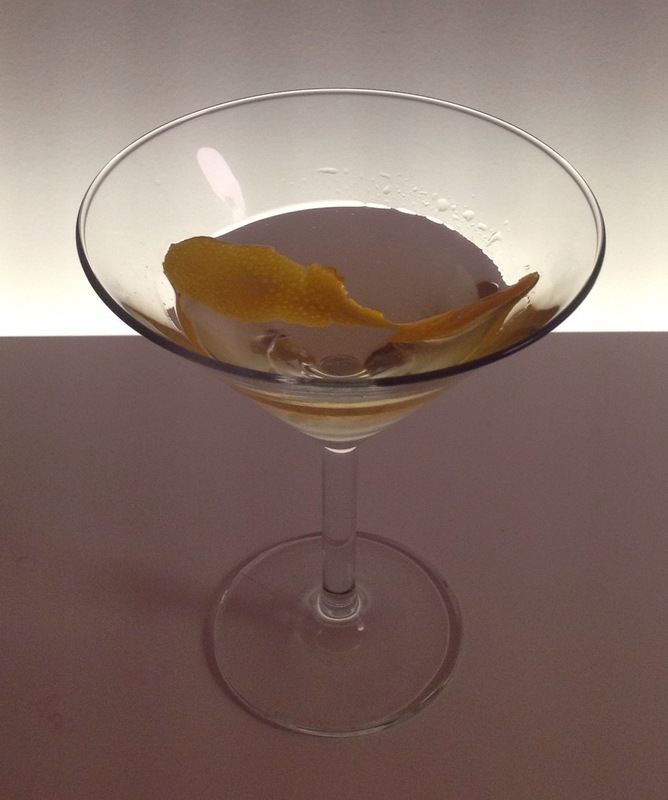 Pour into a chilled Martini glass & garnish with a large slice of orange zest. I recently tried out one of the recipes in the Mojito R-Evolution kit by Molecule-R: the suspended mint caviar mojito. 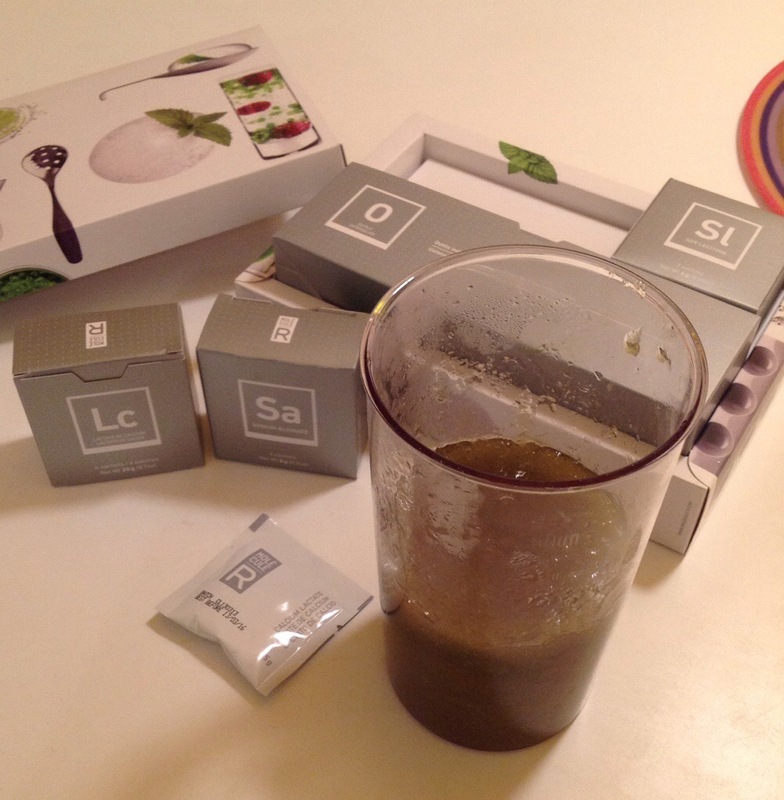 The recipe isn’t terribly tricky – you can see the methodology on their website – you boil up sugar & mint in water, add a thickening agent, and then form the spheres so beloved in molecular gastronomy by dropping the mint gel into a liquid that causes a membrane to form around the gel. What is tricky is forming perfectly round spheres of mint – mine came out like irregular blobs, so clearly plenty of practice is required to make even, consistent mint caviar. I also discovered that the mint solution has a fairly pale green colour when made, so I added a fair amount of natural green colouring to get something approximating the bright green illustrated on the packaging. The third point to note is that the recipe given in the Molecule-R booklet lists lime as an ingredient, then forgets all about it in the method. 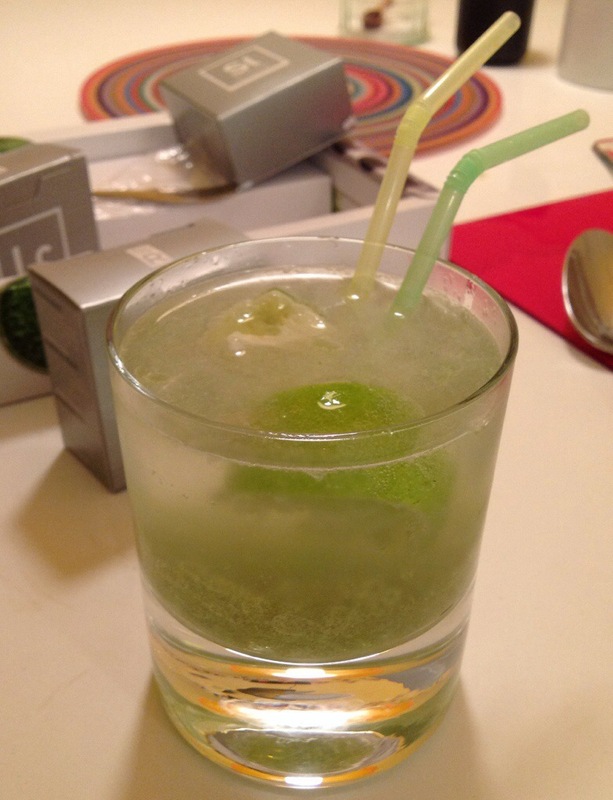 I squeezed the lime into the final mixed drink, as it was lacking something without it, to say the least: a mojito without lime is harking back to the original 1941 version of the drink (according to mixologist David Herpin), but it is not the version we enjoy now. One of the most basic of all cocktails, the Old-fashioned is also one of the finest because of its simplicity: a mix of sugar, bitters and spirits, served over ice with a large slice of citrus zest. Here I have used my Bulleit bourbon & Peychaud’s for the bitters, as the orange flavour suits the zest garnish to my mind. Shake bitters onto a sugar cube & muddle in the glass until the sugar is crushed. Add a few drops of water if liked to dissolve the sugar. 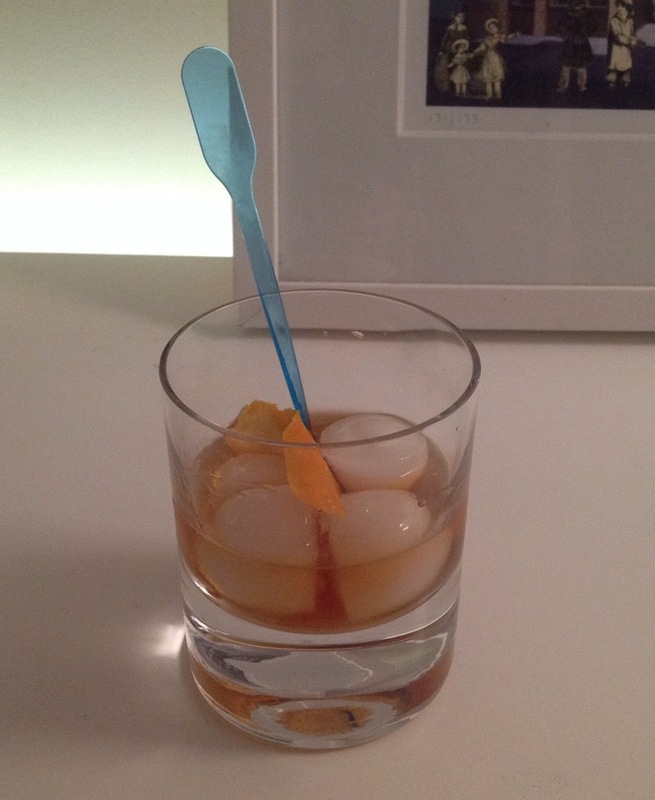 Add ice cubes, then pour bourbon over the ice, and stir, leaving the spoon in the glass. Garnish with a large slice of orange zest. The Old-fashioned seems to be one of the oldest drinks recipes: around 1860, a simple recipe of bitters, sugar & spirits was being called ‘old-fashioned’ as it had been around thirty years by then. The bourbon version seems to have sprung from the Pendennis Club, who passed the recipe to New York, some time around the end of the C19th. It is not the ‘classic’ version of the drink, but many people drink the version of the Manhattan that uses bourbon (here, I’ve used Bulleit, 90˚ proof) as the base spirit. To my my mind, this suits the sweet Manhattan recipe better – using only red vermouth (Martini Rosso) – as the dryness of the white version jars with the flavours of the bourbon. I don’t think it makes the drink undrinkable, though, so it would be worth experimenting to see what suits your tastes better.